Losing Track of your Dev Tasks? This Might Help! Back in the days when we used to develop big budget products for publishing houses, our primary method for distributing project tasks, bugs lists and information was… you guessed it, Excel Spreadsheets. We used them for absolutely everything. And actually, they did a great job. You can cram a lot of information into a tabbed spreadsheet. I still use them for organizing data for games, along with project budgeting and scheduling. And it goes without saying, for crunching those all important budget numbers, they are still unbeatable! But as far as task management goes, things have moved on. That grid of tasks is just too inflexible. We’re all synching data to the cloud now. Data no longer has to be collated and redistributed. It’s all edited right there on the server – and instantly available to your team members. There are many free online task managers to chose from and I have tried a lot of them. I used to manage my tasks with ToDoIst.com – which was good, but I found the mobile versions of the software quite limiting (although I’m sure they will have improved since then). One day, I came across Trello.com while reading a Wired.com article. And I’m glad I did, as it’s perfect for game development. I’m using it to organize my 3D Pool Game. 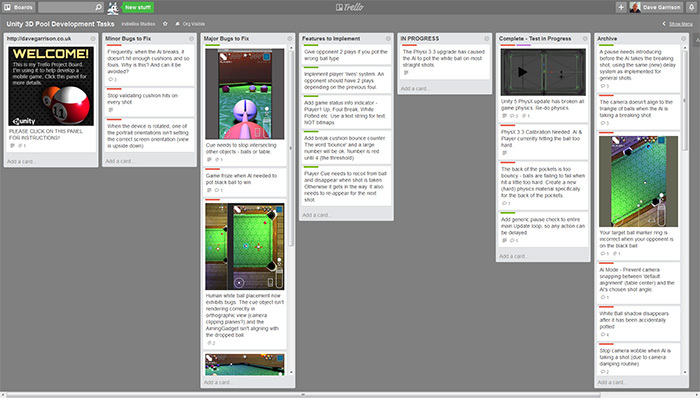 Trello is a deceptively simple looking online application that helps you organize your tasks. I decided to share my experience with the software for two reasons. Firstly, the system seems a perfect fit for software development – both when working in a group or by yourself. And secondly, the ability to make your project (or part of it) visible to the web might actually serve as a means of showing potential clients what you do. It may also give your project some exposure – and even allow your potential customers to vote on features. The background is customizable, you can chose from a range of colours. You can even drop a wallpaper image into the paid version to totally brand your project space. As you can see, the page (or ‘board’) consists of a series of ‘lists’ from left to right. And, each ‘list’ is populated with a number of ‘cards’. A card could represent a task, an idea – whatever works for you in the context of the list. As I said – it looks deceptively simple – but drill down into the cards and you will a find a heap of options, along with an actual comment ‘timeline’. Once you have added a card to a list (see the example on the right), you can enter a detailed description for the card. You can also add coloured labels to the cards which are visible on the Board view. I have labels for Bugs, Serious Bugs, Features among others. From here on in you can attach any resources that you (or anyone else in your team) might need to undertake a task. There are file size limits (on the free version), but these haven’t yet posed an issue for me. I’ve been attaching bug screenshots taken from my mobile device for reference when I’m at my desk. Say, for example, you’re testing your product outside of the office. All you need to do is grab a screenshot (power + main button on iOS, power + volume down on Android). Then you can simply run Trello on the device and attach the image to the card. How useful is that? I mention devices here – Trello runs in the browser on your PC, but it also has dedicated apps available for iOS, Android, Kindle Fire and Windows 8. I have it running on my iPad and a very low-spec Android phone – and it works great. The iPad version is particularly clean and nice to use. I’ve been using Trello to keep a log of my development tasks and bugs, filing each one into a different List. The general idea is, you work on a task, update its contents, then move the Card on to another List that represents a different stage. So, I might add an idea into the Features List. Move that to ‘In Progress’. Then when complete, on to ‘Testing’ and finally the ‘Archive’. But really, you can organize your boards however you like. I read a blog by someone earlier who preferred to have Lists assigned to individual team members – primarily to make it clear who was in charge of the task – and who would be responsible for moving the card to the next stage (or team member). There’s a lot of Trello that remains undiscovered for me. But from my limited use, I can see that it has the potential to make unwieldy projects quite manageable. And I like the social aspect of the software – it feels like your project has a ‘hub’ for everyone to hook into. I just wish we’d had something like this when we were working on our Nintendo games! It would have made the QA testing so much easier. I have found it useful anyhow, so wanted to share my experience for any other developers out there who might want to give it a try. 3D Pool Dev Blog: Passive Cue CollisionUnity 5 Physics Update – Will it Break your Game?